Traveling With Tea Story Contest! Win a Tea Geek t-shirt! All you need to do is write a true story of a particularly good or particularly bad experience with tea while traveling. Make us laugh, make us cry, make us smile or make us groan! Whatever you do, keep it short–no more than 500 words per entry. Only one entry per person per category. To enter, simply drop off your story with your name, address, phone number and category (“Good Experience” or “Bad Experience”) at the Perennial Tea Room by 6:00pm August 18th, 2007. Entries can also be emailed to storycontest@teageek.net–same information required, same deadline. Finalists will be judged at the “Traveling With Tea” class at the Perennial Tea Room the following week. No purchase necessary, and you don’t need to be present to win. We’ll contact the winners of both categories by the end of the month so they can choose their shirt. Now get writing! There are two Tea Geek T-Shirts at stake! Posted on 30 July, 2007 Author Michael J. CoffeyLeave a comment on Traveling With Tea Story Contest! I’ve just confirmed that Tuesday, 21 August, I’ll be teaching a tea class called “Traveling with Tea” at the Perennial Tea Room in Seattle’s Pike Place Market. Also, I’ll be teaching a series of introductory classes to the world of tea at the Phinney Neighborhood Center in north Seattle. Be sure to sign up for the Tea Geek newsletter to get the full information when it’s ready! 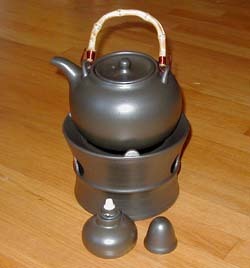 Last night Tea Geek put on a class at the Perennial Tea Room. It was the first real-life offering of “The World of Tea.” I had offered it previously on Second Life, but had to change the format because in a virtual world it’s hard to do taste comparisons. Anyway, it was quite successful. We sold out the seats, and it was a good audience. The feedback was great overall, with the only “negative” being expressed was that several folks wanted to know more about the basic types of tea. The shop sold a bunch of stuff afterwards (good for them!) and about half of the attendees signed up for my mailing list (good for me!). Maybe next time I’ll do less tea culture and history, and more about the actual tea processing. Unfortunately, if we’re tasting based on geography, we’re going to be drinking black tea. China, Japan, and Taiwan are the only places were non-black tea is made and exported in any kind of quantity. Or maybe just look at China. I don’t know–I’m open to suggestions. Please leave a comment if you think any of these ideas are particularly interesting to you. Thanks! Sometimes, after a particularly intense geek-out, I’m asked how long I’ve studied tea. (If you’re curious, I’ve been drinking tea regularly since a trip to London in 1988 and the first class about tea I attended was in 1993 or 1994). Many new to the vastness of the world of tea are daunted by the sheer variety and everything there is to learn about it. Here, then, is my checklist for what to try if you’re just getting started. It’ll give you a survey of some of the famous teas from the major growing regions. Ask your local tea shop for brewing advice on each, as they will probably know the peculiarities of the teas that they sell. Get a sample, or whatever their minimum quantity is. Brew them up and pay attention to the flavor. Take notes–it’ll help you differentiate them better, and help you explain what you like and don’t like when you go back to buy more. Teas from India are almost all black tea, so for your India sampler, explore by region. Baozhong (a lightly-oxidized oolong). This is sometimes called “pouchong,” the old transliteration from Chinese. The Wenshan region, especially around Pinglin, is famous for this tea. Bai Hao, aka Oriental Beauty (a darkly-oxidized oolong). This will give you a nice contrast, and is another famous Taiwan tea. Pick a couple of so-called “Ceylon teas” (Ceylon is the old name for Sri Lanka and the tea industry hasn’t caught up yet). Go for individual estate names, or teas from different regions. Perhaps the most famous region here is Uva. Generally, the higher the altitude it’s grown at the better. Same with Kenya–try a couple. Kenya produces a great deal of bulk tea used in blends, tea bags, etc. and can sometimes have a very strong flavor. Posted on 23 July, 2007 Author Michael J. CoffeyLeave a comment on Where to Start? Although I entitled this post My Independence Day Toys, it’s a lie. One of my new toys I got July 6th, the other I got the day after. But I figure it’s close enough, and I might run out of interesting ways to name articles when I get new stuff. Regardless, I have a couple of geeky bits of equipment that I wanted to share. My other new toy is a pre-weighted tea balance. Tea professionals often use scales like this to weigh out the perfect amount of tea for the standard brewing cup (it’s an item I like to call the “toothy cup” because the edge has a serrated section that allows you to strain the tea between cup and lid). 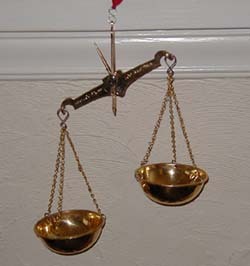 This scale was made in India and came to the United States via Germany. Industry standard is 2.25 grams per 6 oz. of water and this is a lovely and elegant way of weighing out dry leaf for demonstrations, classes, and so forth. And between classes, it can hang from my fireplace mantle as a decoration (though I probably should check with my partner, Loren, before I leave yet more teaware hanging around…) Anyway, I love both the long tea-trade tradition the scales represent, as well as their combination of usefulness and beauty. Recently, we tasted an oolong at the teashop where I work part-time. It was a tieguanyin (Iron Goddess of Mercy), made from the varietal of the same name. The supplier’s sample described it as being “fruity.” Well, they were dead on. We tasted it next to our Master’s Choice Tie Guan Yin and it was like tasting two different teas. Our regular TGY was what I’ve come to expect–round, lush, and richly floral like an orchid or gardenia. The sample, though, was sure fruity. It was like someone had poured lemonade into the cup instead of tea. Had I just tried the cup without having brewed it, I would have guessed that it was either flavored, or that it was something like a lemon myrtle tisane. It was wonderful and smooth and refreshing…but not at all what I’d expect from a TGY. We are, by the way, bringing it in under the name “Emerald Goddess” if you’d like to pick some up. Although it’s not arrived yet (as of 6 July 2007), you could call the Perennial Tea Room at 888-448-4054 and ask to be informed when it comes in. I know I will…it’s at least worth a couple of ounces for a novelty tea if you don’t fall in love with it.